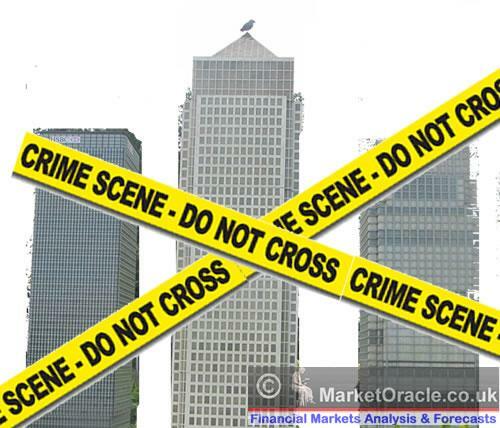 UK Interest Rate Swaps Financial Armageddon, Bankster Mis-Selling Bigger than PPI? Following the multi-billion PPI Mis-selling scandal, just when you thought it could not get any worse, Britain's crime syndicate that is our biggest banks have been revealed to have taken another systematic bite out of thousands of unsuspecting small businesses on a scale that could end up resulting to be as big as that of the mis-selling of PPI insurance. The banks and building societies after losing a court case in April 2011 brought by the British Bankers Association, were forced to start repaying what a year ago was estimated as approximately £5 billion in mis-sold payment protection insurance to their customers that in the vast majority of cases proved totally worthless. Barclays started the ball rolling by trying to ingratiate itself with its angry customers by automatically refunding all legitimate claims that had been submitted to date, with the other banks seeking to write to over 3 million customers over the subsequent year which has seen the estimated total mushroom to now £15 billion. My own personal PPI experience was when I opened a credit card account with Lloyds TSB Bank many years ago, despite specifically rejecting their offer to add payment protection insurance to the credit account they STILL signed me up to it and and started to charge me on a monthly basis. I immediately complained and stated that I specifically told them that I did not want it, against which they relented and stopped charging me for a service that I never wanted in the first place, though never refunded me for the payments they had taken. This type of behaviour illustrates why over 3 million people have been mis-sold PPI. The mushrooming estimated compensation from £4 billion to £15 billion now has gone hand in hand with what is just as bad which are the relentless hundreds of PPI claims companies that constantly cold call throughout the day, it has got to the point where I am sure many people that just like me don't answer the phone any more to unrecognised numbers because it will likely turn out to be just another PPI claims firm or another cold caller such as "sign up to our broadband", "change your energy provider" etc. Reason for complaint i.e. that you did not want it and nor was it explained properly, or if you are self-employed or part-time that the policy was not valid for you as you could never have claimed on it. The financial ombudsman service has for a some time made available a detailed questionnaire that you can use as a further guide for a complaint, though this amount of detail is probably now no longer necessary (download the consumer questionnaire in Word format). Interest Rate Swaps Mis-Selling - What are Interest Rate Swaps ? Simply these are derivatives contracts that hedge against a change in interest rates. Very similar to the examples of Fixed, Capped and Discount rate mortgages. However most of the Swaps sold to small businesses were hedges against a rise in interest rates (usually linked to base rate), i.e. the contract would pay out the the difference between the strike rate and the prevailing higher market interest rate, or charge them if the market rate was lower than the strike rate. Small business wants to borrow £250k from the bank over 5 years, loan requires to buy an Interest rate swap product (Fix the rate) to protect against a rate rise. Business given the impression it's like a fixed rate mortgage and unaware of the key consequence that the penalty for early exit would be 50% of the original loan £125k, also prompted to buy a fix that is longer than the loan term so that it generates more commission for the bank. Base Interest Rate Swap Strike rate 5.5% - Credits for any rise above 5.5%, Debits for any fall below 5.5%. Interest rates crash following Financial Armageddon resulting in a base rate at just 0.5% (for 3 years) making the small business liable for an extra 5%, or £12,500 per year (probably plus extra fees), Plus HIGH early exit costs of 50% of the original loan (£125k), despite being told that they could exit at anytime without cost. The result is that these products have been directly responsible for bankrupting many small businesses and draining cash out of many more businesses which is the exact opposite of what the record low interest rates were supposed to achieve. The FSA as usual has been deaf dumb and blind to the criminal activities of its bankster brethren as the the banking sector and regulator senior staff operate a revolving door between them, one day a banker, next day a regulator and then back at being a banker, which ensures that there is only ever 'light touch' regulation of the big banks crime syndicate. However, the FSA under much political pressure is slowly starting to address Interest Rate Swaps mis-selling, though as explained above it is likely to take some time before businesses are compensated which means in the meantime many more businesses will go bust. How Big Could Mis-Selling be? It is early days, current estimates put the bill at £3 billion. However at a similar point the PPI was estimated at just £2 billion which has now mushroomed to £15 billion. So Swaps mis-selling could get to a similar amount if not greater than PPI's £15 billion. The bill for all bankster crimes will ultimately be paid by ordinary tax payers as a continuous stream of Bank of England bailouts that is Quantitative Easing that inflates consumer prices. AVOID THE Swaps Mis-selling Claims firms that will soon start springing up like mushrooms. Instead write a letter of complaint to your bank. Depending on their response, complain to the Financial Ombudsman, however compensation is capped at £150k so court action may prove necessary. In which case compile a full dossier of information, including requesting documents and transcripts of any phone calls from the bank. The current market rate is 1.5% for a 5 year swap - Which means IF interest rates go up then this should generate a credit / profit. However the RISK is that if market interest rates fall further then the difference is the price paid. Also market interest rates and those that the banks will sign you upto are not the same as banks add their commission on top of as much as 1%. 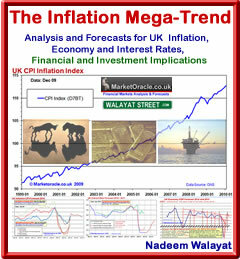 My long standing forecast (March 2011) is for UK base rates to target a rate of 4% by the end of 2014.